NEW YORK, April 5, 2017 /PRNewswire/ -- SiriusXM announced today that André Leon Talley, famed fashion expert and former Vogue editor-at-large, will host a live one-hour talk show exclusively on Andy Cohen's SiriusXM channel Radio Andy. Full Length will feature Talley, along with celebrity guests and friends, discussing all-things fashion, the biggest moments in pop culture, and breaking down the hottest style trends. This special limited-run series will launch on Friday, April 14 on SiriusXM's Radio Andy channel 102. 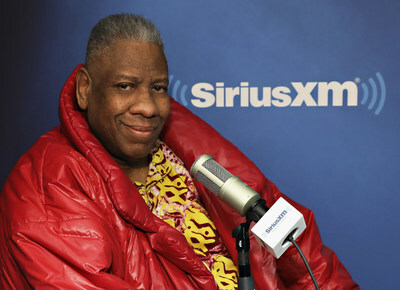 "My SiriusXM radio show will, of course, be fabulous," said André Leon Talley. "We will cover it all—from global style influences and trends, to iconic pop culture moments that wowed us. Full Length will showcase the connection we all have with fashion." "André Leon Talley is one of the most entertaining and knowledgeable men I've ever met—he was made for Radio Andy," said Andy Cohen. "He is one of the most indelible personalities in fashion and the perfect fit to share personal stories and insider trends for SiriusXM listeners," said Scott Greenstein, President and Chief Content Officer SiriusXM. Talley was the former American editor-at-large for Vogue, and has been a front-row guest at fashion shows around the globe for the past 25 years. He is the author of A.L.T: A Memoir, as well as A.L.T 365+, an art and photo book, and the co-author of the book MegaStar. Full Length will air weekly on Fridays at 11 AM ET / 8 AM PT on Radio Andy, and on the SiriusXM app on smartphones and other connected devices, as well as online at siriusxm.com. With content created and curated by Andy Cohen, SiriusXM's Radio Andy channel includes shows hosted by Andy Cohen, Sandra Bernhard, Bevy Smith, Dan Rather, John Benjamin Hickey, Jim Parsons, Jill Kargman and more. Sirius XM Holdings Inc. (NASDAQ: SIRI) is the world's largest radio company measured by revenue and has approximately 31.3 million subscribers. SiriusXM creates and offers commercial-free music; premier sports talk and live events; comedy; news; exclusive talk and entertainment, and a wide-range of Latin music, sports and talk programming. SiriusXM is available in vehicles from every major car company and on smartphones and other connected devices as well as online at siriusxm.com. SiriusXM radios and accessories are available from retailers nationwide and online at SiriusXM. SiriusXM also provides premium traffic, weather, data and information services for subscribers through SiriusXM Traffic™, SiriusXM Travel Link, NavTraffic®, NavWeather™. SiriusXM delivers weather, data and information services to aircraft and boats through SiriusXM Aviation™ and SiriusXM Marine™. In addition, SiriusXM Music for Business provides commercial-free music to a variety of businesses. SiriusXM holds a minority interest in SiriusXM Canada which has approximately 2.8 million subscribers. SiriusXM is also a leading provider of connected vehicles services, giving customers access to a suite of safety, security, and convenience services including automatic crash notification, stolen vehicle recovery assistance, enhanced roadside assistance and turn-by-turn navigation.